Distracted driving is anything that takes your mind and/or eyes off of the road. 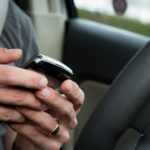 According to the Virginia Tech Transportation Institute, a person is three times more likely to be in an accident when a cell phone is in use. Texting, talking on the phone, reaching for something, changing the music, checking your phone, checking the GPS, eating or drinking, putting on makeup, among other activities are all ways that we are distracted as we drive. ver and an estimated nine people die every day from a crash involving a distracted driver. What Can You Do To Combat This Issue? As your children begin to learn to drive, or even as you are in the car with others, let them know that it’s not okay to drive while being distracted by fiddling with the GPS, texting, or any other multitude of ways they may be tempted to multitask, if even just for a moment. Be an example to others, if you must text, change the route of your GPS, or anything else while driving, make a no exceptions rule to always pull over to do it. At Lee, Gurney & Hess, we always want you to be safe as you travel. However, if you or your loved one do suffer from an injury at the hands of a distracted driver, it is important to contact an experienced personal injury attorney at Lee, Gurney & Hess as soon as possible.